LAselect is a programmable DLL-Engine that generates sorted indices from structured and unstructured data. Simple interface through VBA's conditional statements, no DLL knowledge required. LAselect offers new ways to look at data. It adds Non-Destructive and Fuzzy Sorting, Targeted Shortlists, Data Mining and Data Conversion capabilities to VBA/Excel and greatly simplifies creation of complex sorting jobs. It is estimated that 80% of the worlds electronic information is not structured inside databases, tables, etc. Even a seemingly structured solution like Microsoft's Excel can hold a vast amount of unstructured data within its strings. LAselect can be "made to understand" any type of information; be it structured or unstructured, complex or fuzzy. It can be fine-tuned to any data format, be controlled on a record-by-record basis and it can change strategies on the fly. As an example, Number Sort, which can be found in the demo application, detects if numbers are textual ("onehundred") or real (99) and sorts them correctly. Applications for LAselect include complex data, i.e. data having a single overall value defined by more than a single property. Think of sorting IP-numbers and subnet masks or sorting volume while only measurements are given. Teach LAselect coordinates and it turns a list of unsorted coordinates into a list of sorted distances. 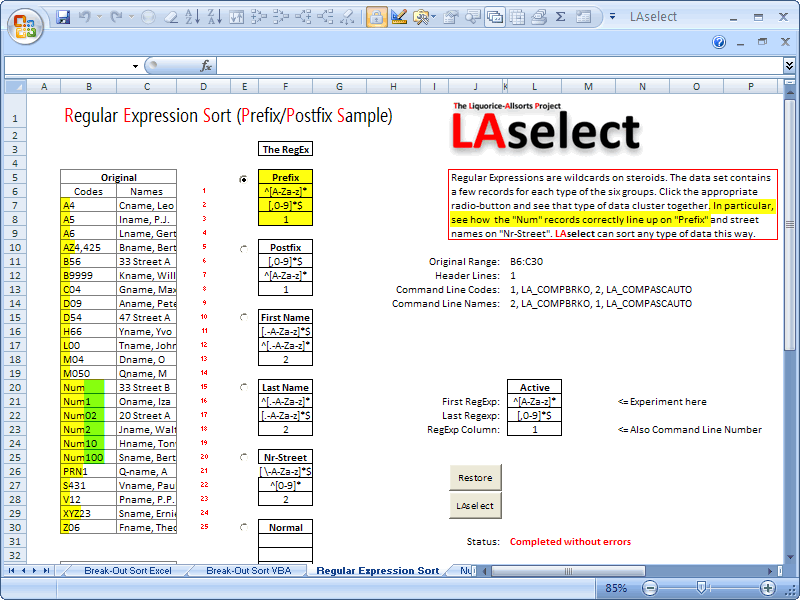 Note that unlike a conventional sorter, LAselect can produce output partly or totally different from its input. Fuzzy Sorting is another area that LAselect is useful for; the processing of items with imprecise or fuzzy properties. A standard sorter returns 50mm as being larger than 49mm; program a go-no-go margin into LAselect and it returns them as being equal; this keeps them around for more important factors instead of pushing them to the bottom of the pile early, for no good reason. A single call sorts all rows and columns your version of Excel can possibly hold.